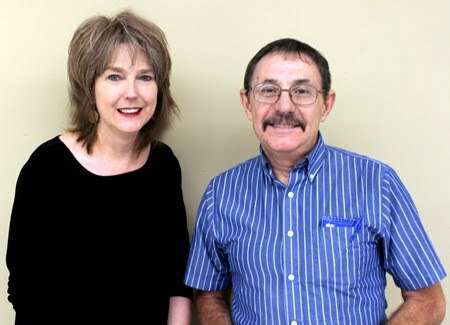 Interview with Steven Calloway conducted August-September 2010. All photos courtesy of Steven Calloway. Special thanks to Brandan at Lone Star Stomp for clueing me in to this record. Steve Calloway picked up his first guitar when he was a fifth grader at Fountain Elementary. "My parents bought me a Silvertone at Sears," he said. "I took lessons for two years, but I didn't want to learn the music they wanted me to - I wanted to play rock and roll." At the tender age of 10 Calloway got his first paying gig, with The Unknowns. The group also included 12-year old Bobby Montoya, and both of their fathers. As word got out about the young guitar phenom, he was soon recruited as a member of the Tyme System. "Once I got out of East High School, in 1969, it was either go to Vietnam or go to college - I decided to go to college." In 1972 Calloway joined up with John Withers (later of Little Ricky and the Roosters), Gary Fowler (Nightingales), and former East classmate Leon Salazar, in the band Kemikol, but after a few years, he was looking for another group. 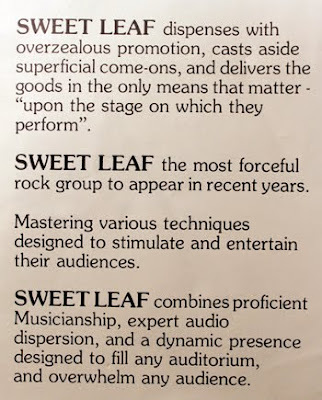 "Leon played drums, and he introduced me to guitarist Calvin Drum, and bassist Dave Cirullo, and we decided to form Sweet Leaf." 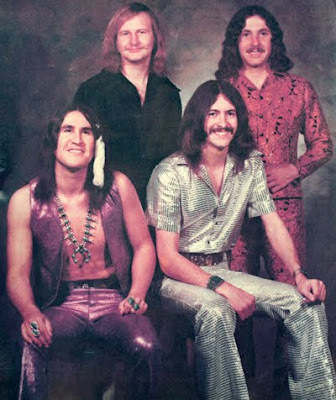 Contrary to the obvious drug euphemism (and the name of a drug-referenced Black Sabbath song), Calloway insists marijuana slang was not behind the band's name. "We really didn't name the group after pot, we really didn't - we just liked the name," said Calloway. "That said, we knew that people would probably equate it to that." 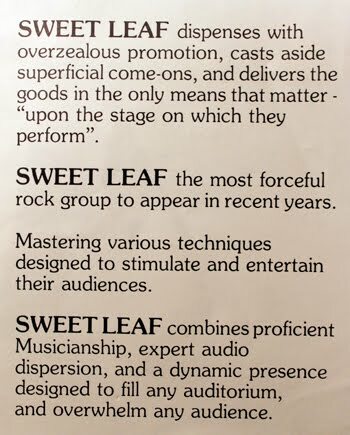 Unlike most garage bands of the day, Sweet Leaf members managed the band like a well-oiled machine. "We kept books, and paid income taxes," said Calloway. "We were booked a solid six to eight weeks ahead. In fact, the worst year we ever had was being booked for only 49 weeks." The band promoted itself heavily, printing up brochures, calling cards, and color photos. They bought a used school bus, tore out the seats to carry their equipment to gigs, and had the name of the group painted across it. "Unfortunately it broke down in Chugwater, Wyoming," Calloway admitted. 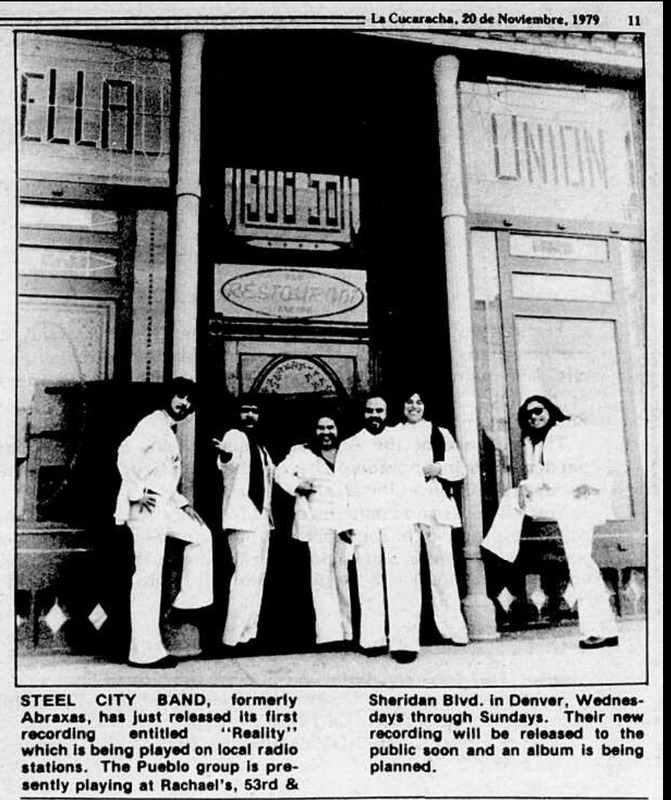 In 1975 the band had amassed an impressive catalog of original songs, written mainly by bassist David Cirullo. Ever the self-promoters, they decided it was time to put out a single. Funded by Cirullo's parents, the group headed to Clovis, NM to the famed Norman Petty studios. "I really don't remember how we got Norman Petty to record us - but I do remember we spent about eight hours in the studio with him. We had never been in a studio before. He did the mix for us, and helped us with the harmonies." 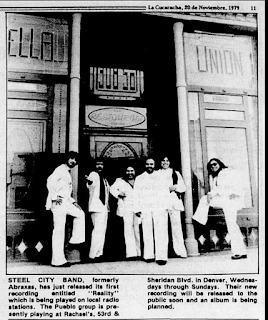 Pressed on the band's own Elmwood record label (named after the street where Cirullo's parents lived), the single was sent out to stations, nationwide. The band credited Cirullo's parents, Mary and Ben, as producers on the disc. "Indian Man" was chosen as the A-side. The song, written by Cirullo, told the story of Sitting Bull - complete with war cries accompanied by heavy guitar riffs. The single was a natural fit for the group, whose drummer, Leon Salazar played up his own Native American roots wearing braided hair, feathers and turquoise. 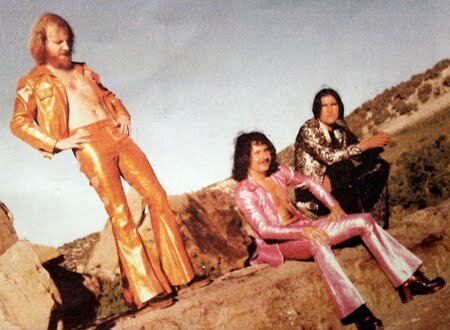 The soft rock, Cirullo-penned flipside "I Need You" showcased the group's diversity beyond the normal hard rock set list they were known for. 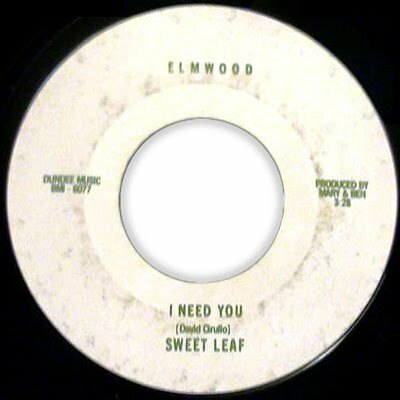 Listen to "I Need You"
"The single got a lot of of play in KDZA, in Pueblo, and it got us a lot of jobs, including opening for Freddie King, and the group Sugarloaf." The band also began to perform a more theatrical show. "We started doing a fire act – we would light the drums on fire and we almost burned down a bar in Lamar. I think we caught the dance floor on fire." 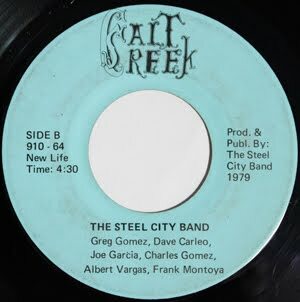 In 1976, Dave Cirullo decided to leave the group, and the band continued as a trio, with Calvin Drum moving from guitar to bass. By the early 1980s, Calvin Drum wanted to leave the band, and was replaced by Steve Johansen. "My daughter was born in 1983, and I started getting a different attitude about things," Calloway said. "That's when I decided to quit - the band formally broke up in 1985." Calvin Drum passed away in 2004. Leon Salazar still lives in Pueblo, but was unavailable for comment on this article. David Cirullo retired with the Pueblo County Sheriff's office, and declined to be interviewed for this story. Calloway went on to play in Land Sharks, and took occasional local gigs. He currently works as the manager of local supermarket. "It's a young man's game, the parties wouldn't start until 2:00 a.m., and I just couldn't do it anymore." he admitted. He still has his Silvertone guitar.